Facebook's legal war with Brazilian government seems to be never-ending. Facebook-owned cross-platform messaging service WhatsApp has already been blocked a total of three times in Brazil since December for failing to comply with a court order asking the company to access WhatsApp data under criminal investigation. But, now the Brazilian government has taken an even tougher step. On Wednesday, the public federal prosecutor in the Brazilian state of Amazonas said the court froze 38 Million real (US $11.7 Million) of funds held in Facebook's bank account, Reuters reports. 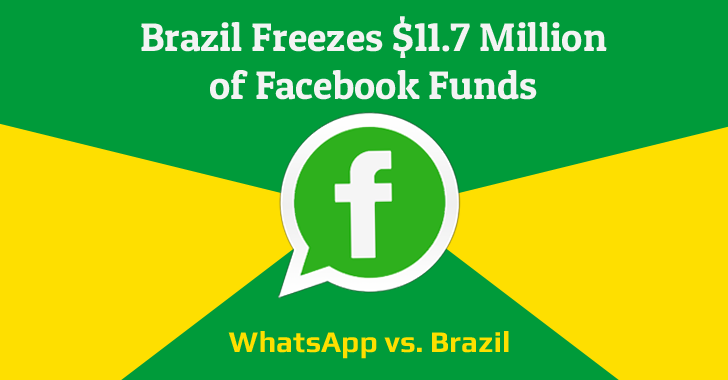 The prosecutor has said that the decision to freeze Facebook funds was made after the social media giant failed to comply with the court order to hand over data of WhatsApp users who are under criminal investigation. Since WhatsApp communications are end-to-end encrypted, even the company would not be able to access any message exchanged between users. Facebook representatives weren't immediately available for comment on the recent decision by the Brazilian court. "In recent months, people from all across Brazil have rejected judicial blocks of services like WhatsApp. Indiscriminate steps like these threaten people's ability to communicate, to run their businesses, and to live their lives. As we have said in the past, we cannot share information we don't have access to." The court case between the Brazilian government and Facebook has been long-running now. The court has previously banned WhatsApp for three days, but the most recent ban came last week when Brazillian judge Daniela Barbosa ordered the telecom operators to shut down WhatsApp nationwide. But a few hours later, Brazil’s supreme court suspended the ruling. In March, Judge Marcel Maia Montalvão of Sergipe state ordered the incarceration of a Facebook executive for not turning over data from a WhatsApp account tied to a drug-trafficking investigation. Facebook Vice President Diego Jorge Dzodan was arrested on his way to work in São Paulo and jailed, but subsequently released the next day.